T-EVMS has six planning views: Planning in Process, Integrated Master Plan, WBS Detail, OBS Detail, RAM Detail, and Integration Detail. Users can modify these using standard MS Project functionality, but they can always use the T-EVMS Reset View tool to get back to the default settings. The use of custom outline codes means that these views will always roll-up cost and schedule data by whatever planning category is desired. Managing the baseline is the heart of earned value management, and T-EVMS baseline change automation tools make this process both simple and amazingly powerful. 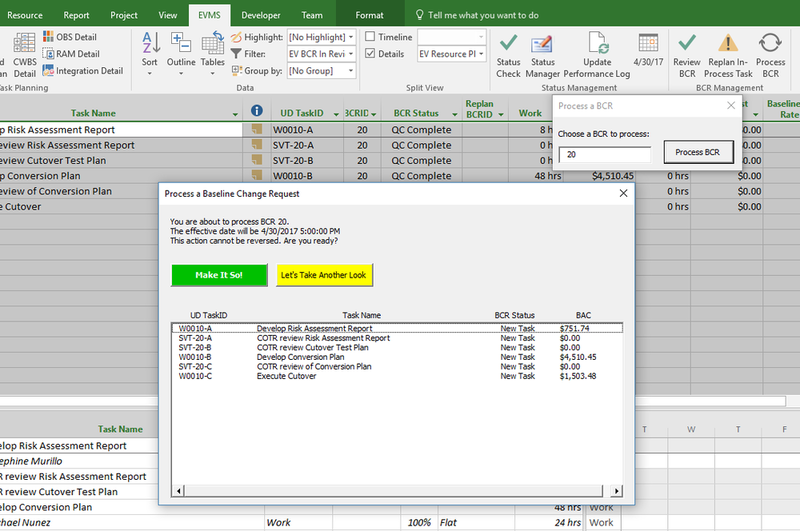 Integration between the BCR Management Tools in MS Project and the BCR and Budget Logs in Excel is straightforward, allowing for full visibility into both executed and in-process changes. Rolling wave planning is easy to visualize and implement. You can even re-plan in process tasks (if absolutely necessary) and both the schedule file and the logs will precisely track the change so that you do not violate the system description. Status management in T-EVMS is aided by an automated Status Check tool that performs a series of tests to ensure that common status problems (estimated finish before the project status date, actual start after the project status date, etc.) are identified and highlighted, with notes suggesting corrective actions to the CAMs and Scheduler. Earned Value is also automatically calculated by the Status Check tool based on the EV Type selected and status provided. Updating forecasts is simple as well. Just select the task(s) that are being updated, and use the resource allocation screen to change the resources assigned, estimated effort, or other direct costs as needed to reflect the new estimated costs. Forecasts, like baselines, store up to three different cost categories (unloaded, loaded, and price) for each resource, and you can switch between viewing these different categories with a single button click. Allocate effort with work contours, or manually adjust as needed to provide the most accurate estimate possible for you project: with T-EVMS this process is much simpler than filling in spreadsheets! The Integrated Performance Management Report (IPMR) and the Control Account Plan (CAP) are the primary automated reporting outputs from T-EVMS, ensuring that project teams can meet contract deliverable requirements. 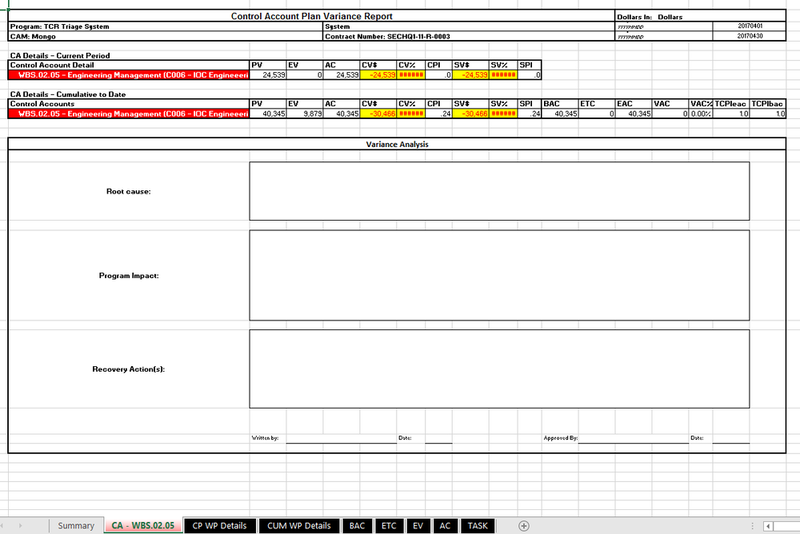 The CAP s generated at both the overall program level and by Control Account Manager (CAM), and it includes both a summary list of control accounts with variance indicators and a detailed report for each control account, with narrative fields for those that exceeded variance and need analysis. CAP reports also include all of the detail from the Baseline, Forecast, Performance, and Cost logs. 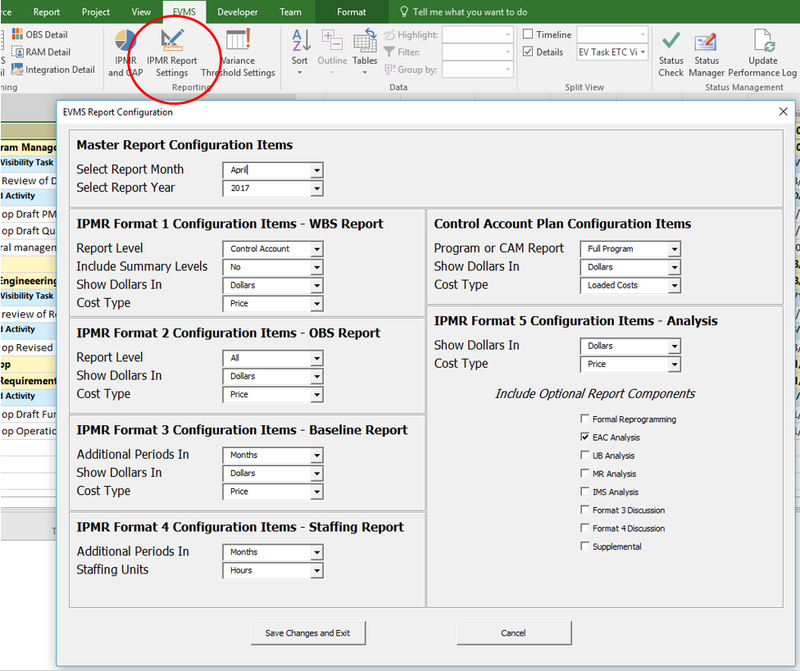 Both the CAP and IPMR are provided in Excel format so that CAMs can generate any custom reporting or internal analysis they need. Budget Log, Work Authorization Documents, Contract Configuration, Requirements Traceability, Risk Management. Call for a demo!